I hope you had a wonderful weekend. The weather in DC was fantastic and it is really starting to feel like summer. Today's topic is a truly summer top - the peasant top is perfect for warm summer days because of it's loose and breezy fit. 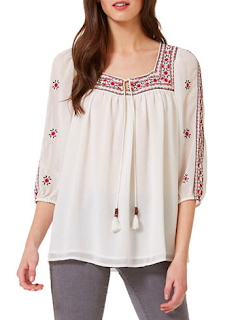 This style of top comes in so many colors and styles, I'm fond of the embroidered ones with that extra piece of detail. This top says summer. Simple with pops of color. A big scoop neck is casual and dramatic. 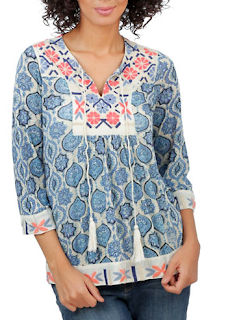 Great color combination and I love that even with a busy pattern, you can still wear a necklace. How about a patterned top? What a great way to play with prints. 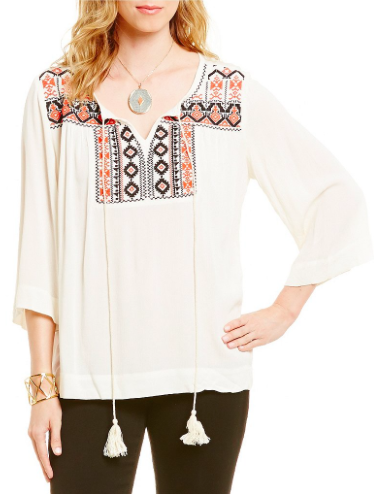 Peasant tops have come a long way from your hippie Aunt's closet. I think the embroidered options really stand out from the rest.